Between makeup, dirt, sun exposure and pollution, your skin certainly can take a beating. That’s the bad news. The good news is that a nightly skin care routine that protects and nourishes your skin can help keep your skin healthy and healthy looking. Here are ten easy and convenient nighttime skincare tips from our experts at Vanguard Skin Specialists. Makeup, oily skin residue and pollution can leave dirt on your face that you don’t want to wake up with in the morning. That’s why cleaning your face before bed is so important. Cleansing the skin can help prevent the spread of bacteria, which cause breakouts; as well as provide your skin a fresh palette so you can apply other helpful products such as toner and moisturizer. Wash your face with a combination of warm water and a gentle cleanser, being sure to rinse thoroughly. Those who have acne-prone skin may want to use a medicated formula as recommended by their dermatologist. The same is true if your skin is particularly dry or oily. 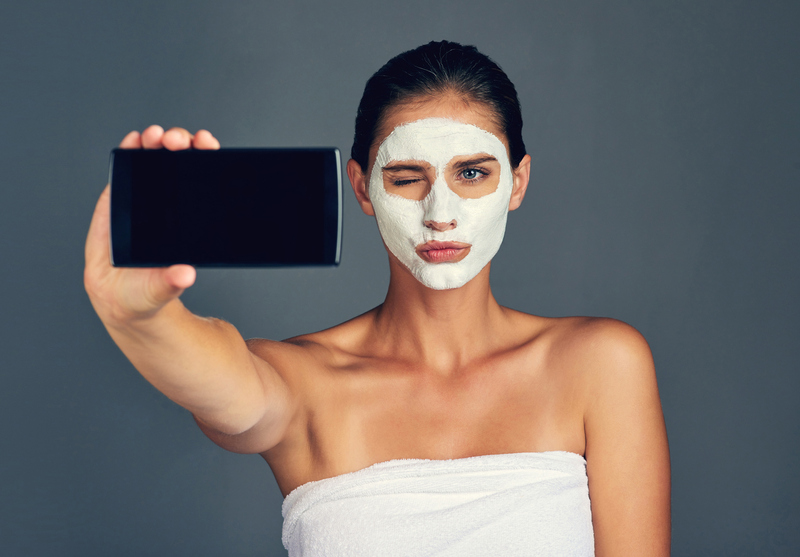 Toning is an often overlooked but important step of the nighttime skincare routine. That’s because toner helps restore the pH balance to your skin after cleansing and before applying any other products. Mandy, Vanguard’s aesthetic registered nurse, advises of the importance to restore pH balance to the skin before applying any Vitamin A products. “Many of our patients use tretinoin or retinol (forms of Vitamin A); using a toner before these products rebalance the skin and also removes last traces of makeup and dirt,” she notes. When choosing skincare products ensure you use treatment creams and serums that contain potent ingredients. Products that are watered down or full of harsh chemicals can do more damage than good; therefore, choose your products wisely. Mandy advises her patients to apply their treatment products at night, not only to regenerate the skin but to permit enough time to really allow the potency of the treatment creams and serums to work their magic. When you wash your face, natural essential oils get washed away as well. Moisturizing helps to replenish and nourish your skin. Nurse Mandy recommends that moisturizer be applied after following cleansing, toning, and using any treatment products. If you have oily skin, you can use a water-based moisturizer. When you think of moisturizing, it’s equally as important to moisturize other parts of your body as your face, especially hands and feet. In the winter, your hands and feet tend to get cracked. If this happens to you, apply lanolin or aloe-based formulas, then put gloves on your hands and socks on your feet to retain the moisture while you sleep. As good as it may feel, a long, hot shower can actually dry out your skin. That’s why Vanguard’s board-certified, fellowship trained dermatologist and Mohs surgeon Dr. Vinh Chung advises that for dry or sensitive skin, you shorten the time in your shower and make sure it’s not so hot — especially in winter and when you live at high altitudes. Dr. Chung reminds that once you exit the shower, be sure to moisturize so that you lock the moisture into your skin. Dr. Chung loves Colorado winters, but also knows how it can wreak havoc on your skin, especially when you turn up the heat. Dr. Chung explains: “Turning on our heaters further dries out the Colorado air, allowing our homes and offices to become the equivalent of a ‘beef jerky machine’ that can dry out our skin.” Dr. Chung recommends you turn on a humidifier while you sleep to keep moisture in the air and in your skin. “Running a humidifier during the winter months will keep moisture in the air as well as in your skin, which is especially advantageous at our high Colorado elevations,” he explains. You’re going through the process of cleansing and caring for your skin; however, if you don’t clean or change out your pillowcases, you will reintroduce bacteria and oil onto your skin when you sleep. If you have acne-prone skin, it’s even more important to sleep on clean pillowcases. Sleeping on your stomach or side puts constant pressure on your face which, over time, can cause unwanted sleep lines. By sleeping on your back and not applying any unnecessary pressure to your face, you can help prevent wrinkles from forming on your face. At first, it may seem difficult to sleep on your back, but the Vanguard aesthetics team says you will get used to it. They recommend keeping your head elevated using at least two pillows while you sleep to reduce fluid retention in the eye area, thus reducing puffiness under the eyes. At Vanguard Skin Specialists, we want you to love the skin you’re in by providing uncompromised medical care in an environment that is warm and welcoming. We provide state-of-the-art treatment in a warm, inviting, and pleasant environment. Please call our office at (719) 355-1585 to schedule an appointment at one of our four locations in North Colorado Springs, Pueblo, South Colorado Springs, or Woodland Park.